4. My skill set could get me a job at _____. 2. Hmmmm...no answer for this. 3. If you have your health, you have everything. 4. My skill set could get me a job in any school, in any office, or in anything with technology. I was a business teacher. We will be watching the Kitten Bowl on Sunday, no Superbowl for us! Have fun watching on Sunday!! So true about one's health. I also answered the same. I wish I had a skill set for technology!!!! Come on....you are great on the computer. Nice we had he same answer about health...it is PRICELESS. I enjoyed my job and the subjects I taught. 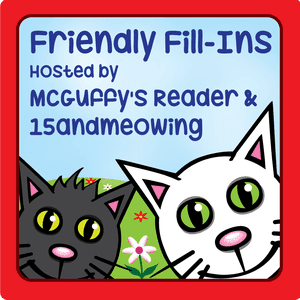 Thank you for joining in on the Friendly Fill-Ins! The only thing special about Super Bowl Sunday at my house is that we watch the Kitten Bowl and Puppy Bowl. That's my kind of sporting event. And I sure wish I had your skills with technology. I am really lacking in that area. Have a wonderful day!